Herbsmith Rehmannia Settle Anxiety is for the dog exhibiting nervousness, hyperactivity and discontentment responding to environmentally induced stress. Herbsmith Rehmannia Settle Anxiety is for the dog exhibiting nervousness, hyperactivity, and discontentment responding to environmentally-induced stress. 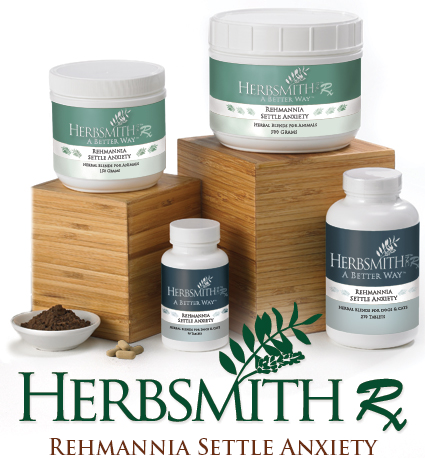 Herbsmith Rehmannia Settle Anxiety also helps to maintain contentment during separation, travel and tension caused by changes in the pet’s daily routine. The herbs in this formula help to maintain calmness and balance behavior. Chinese theory considers anxious behavior to be a disharmony within the body. Herbs can be used to manage this issue. Herbsmith Rehmannia Settle Anxiety is a combination of Chinese herbs that calm the spirit and harmonize the heart and kidney while preserving the dog’s unique vitality. In Chinese theory the heart not only pumps blood, but also houses the spirit and provides the ability to be settled in the world. In a healthy dog, the heart, a fire element (yang), and the kidney, a water element (yin), are balanced. Excessive emotional or physical stress and aging can diminish normal kidney function, which leads to the inability to control heart shen and subsequently allows nervousness to occur. Anxious behavior may also occur due to an imbalance of the heart itself. Any depletion of heart yin or blood may exhibit signs such as heat or agitation. The Chinese herbs in Herbsmith Rehmannia Settle Anxiety are specially combined to support normal kidney function and tonify heart yin and blood, thus calming the spirit.